Cook the mix in a heart shaped cookie cutter! Mine: Covered with smashed banana and almond butter! Plus REAL maple syrup! **Don’t forget to comment on the Banana Nut Cheerios for one of three chances to win!! Contest Link! I woke up this morning and did a quick 30 minute weight circuit at home. It zapped 200 calories and felt great! Brady and I are planning on going to the gym later this afternoon for some cardio. After my mini workout, I didn’t know what I wanted. Brady made himself 2 eggs with mini whole wheat pitas and some fresh tomato. It looked great to me, but I wanted something sweet. I decided on pancakes! Here is what I came up with! Mix all ingredients together and pour into a hot frying pan. Cook throughly on both sides. Serve with blueberries, peaches and a little extra peanut butter! SOO GOOD! I can’t wait to make these again! This morning I made a great bowl of fiber! 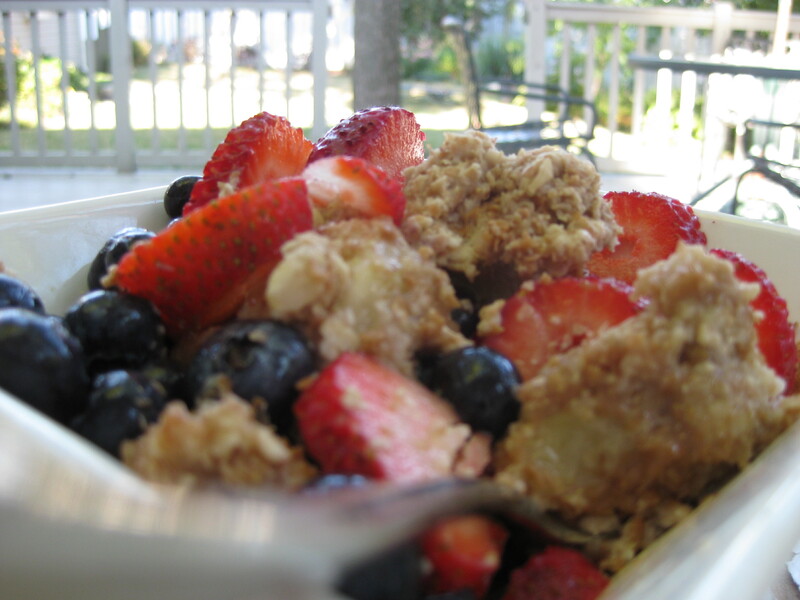 New Blog Feature: Oatmeal Bowl of the Week! We all eat oats each and (almost) every day so I don’t find it necessary to post my bowl each day – even though I would like to, there just isn’t time!! So I am going to pick one bowl of the week to post from now on! After the above have cooked add pears and pb! Tonight was filled with visiting neighbors, wrapping presents and making a delicious dinner! Trim the fat off a few pieces of organic natural chicken. Cut chicken into strips, dip strips into mustard/milk mixture then dip chicken into oat/almond/bread crumb mixture. Bake at 400 for 30 min. or until crunchy. We also enjoyed some broccoli, brown rice and egg plant. Later on I had some yogurt mixed with PB and a pear. Yum! I love peaches! This morning I heated them in my oatmeal with my 1/2 banana. It was so sweet and delicious! I mixed the usual: 1/3 c. oats, 1/4 c. wheat and oat bran with the fruit. I microwaved it all for 1 min. and added extra berries. I ate it at school, otherwise I would have added a little yogurt. Lunch was leftovers, so nothing too exciting there! I also ate 1/2 pure protein bar around 4pm, on the way home from school. It held me over until dinner around 7pm. It felt great to start the morning off with a run! Katie (who just got engaged last night, yay!!!!) and I ran about 4-4.5 miles. She had lots of energy from her great news and I had lots of energy because I haven’t run in a few days. We were happy to get it out of the way while is was cool out this morning. It tasted SO good, and it was pretty too!